To be able to read the signal, the system requires a type of display that can process the information that the instrument is sending. This is achieved through an electronic component that displays the information in a format the researcher can use effectively. The data collected by the instrument is analog based, and needs to be converted into a digital format for the display. This is accomplished by a transducer. The transducer sends the digital energy to the processor, which allows for the processing of discrete times, frequencies, and domains of the signal. This signal is put into a sequence of numbers or symbols that can be displayed on a readout. Several types of readout devices are used in modern instruments. These devices include Digital Meters, Recorders, Cathode-Ray Tubes, LCD panels, and Computer Displays. This image shows an example of what a readout will look like from the signal processed. It is the expected output for the determination of lead. A spectrophotometer with an electrothermal atomizer, was used to collect the data. The first three peaks are those of the standards with concentration of 0.25, 0.50, 1.0, micrograms per milliliter, respectively. 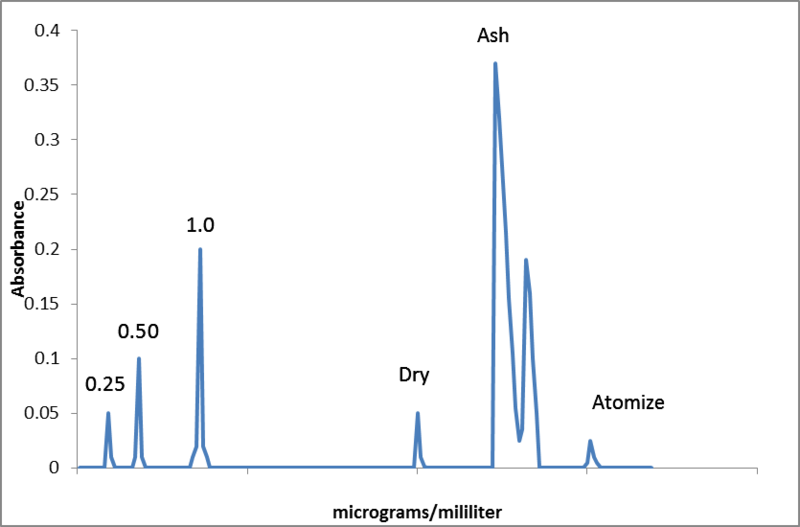 The peaks of the samples are the last three, the first peak, (closest to the standards) is the absorption of the dry, the tallest peak is of the ash, and the very end peak is when the sample is atomized.